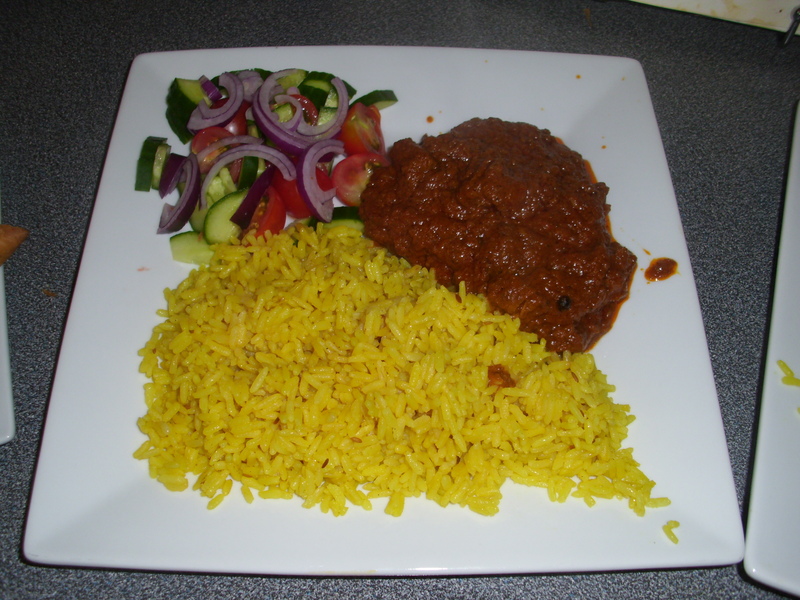 Beef Roganjosh – perfect to come home to after early doors at the pub. The recipe I have chosen today is one that I have cooked many times over the years. We normally have some sort of chicken curry on a Friday but this week I fancied beef. It is difficult to find a recipe for beef curry, as a number of religions, cattle are considered sacred. Some regions, especially India, have banned the slaughter of cattle and eating the meat is taboo. It is possible that the cow was considered sacred because it had a major role in the lives of the Vedic people. They used the milk to make dairy products and the cow itself to till the ground. Even the cow’s excrement was put to use, as fuel, fertilizer and for producing psilocybin mushrooms. These grow naturally from the cow dung and, in modern-day, are known as magic mushrooms! There are some scholars who disagree that the cow has always been sacred. They can cite early Hindu scriptures that show cows and oxen were killed and eaten in ancient times. Today, there are some Hindus who eat beef. In fact, the Dalit Hindus, who have always eaten meat, often protest about having their cow eating rights taken away from them. If anyone who reads this recipe does not eat beef for religious reasons, lamb can be substituted. The cooking time may, however, need to be reduced. Preheat an oven to 160C/150C fan/gas 3. Grind the spices in a small grinder. Melt the ghee in a large pan and fry the beef, bay leaves and spices together for about 15 minutes, over a low heat. Remove with a slotted spoon and set aside. Melt a little more ghee, if necessary, in the pan and fry the onion and cardamom in the vegetable mix together. gently, until the onions are golden, about 10 minutes. Add the tomato puree and mix well. Place all the paste ingredients in a small food processor and blend to a smooth paste. Mix the paste into the vegetables and cook, stirring continuously, for 5 minutes. Add the yogurt and cook, stirring, for a further 5 minutes. Stir in the meat, salt and water. Transfer to an ovenproof dish with a lid, cover and cook in oven for 2 hours or until the beef is meltingly tender. Check occasionally to ensure it is not drying out and add a little more water if necessary.